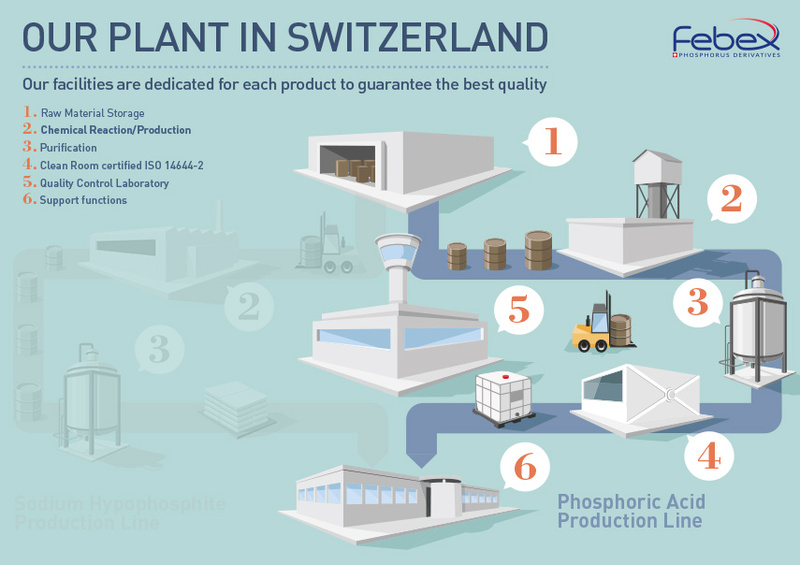 Febex, Europe’s number 1 for electronics Phosphoric Acid, caters to individual requirements of wide-ranging end-markets with its extensive product range. 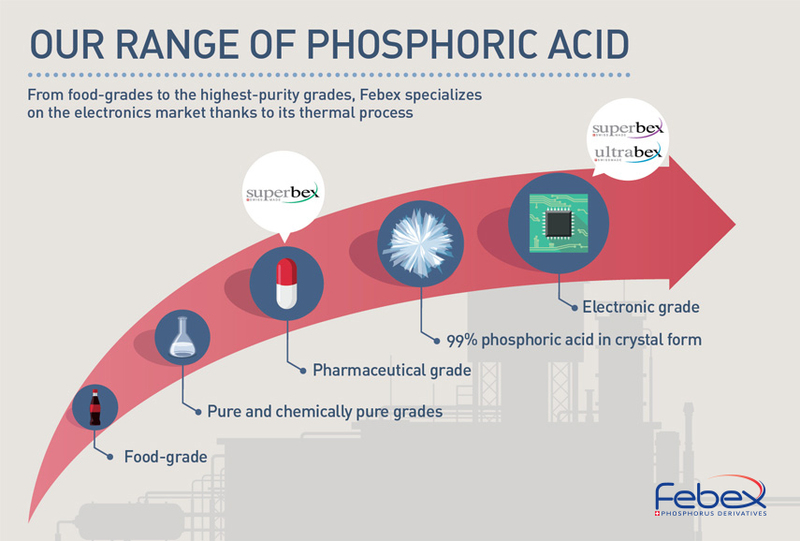 With its unique thermal process, Febex has developed a wide range of Phosphoric Acid, designed to meet the individual needs of its customers. Along with its associated services, Febex stands out with its ultra-high purity product, adapted to electronic and pharmaceutical applications. Our laboratory equipment allows us to adapt the technical specifications in order to meet the individual needs of our customers. With our state of the art production facilities, we can provide the required P2O5 content and deliver a product that is ready to use. The crystallized phosphoric acid is conditioned in 25 kg buckets. Please enquire for any other conditioning and packaging requirements. A unique thermal process for an extensive range of high purity electronic phosphoric acid. Febex’s industrial and analytical equipment enables us to produce phosphoric acid according to individual specifications, conformity guaranteed. The unique thermal process developed by Febex allows a reduction of the impurity content to a concentration on the level of the ppb. Combustion of phosphorus is the first phase of the process. Depending on the desired quality, several purification steps follow, enabling the elimination of impurities according to the specific requests of our customers. One of these steps eliminates Arsenic, a critical element for most industries. The concentration of the solution is then adjusted to the desired level. 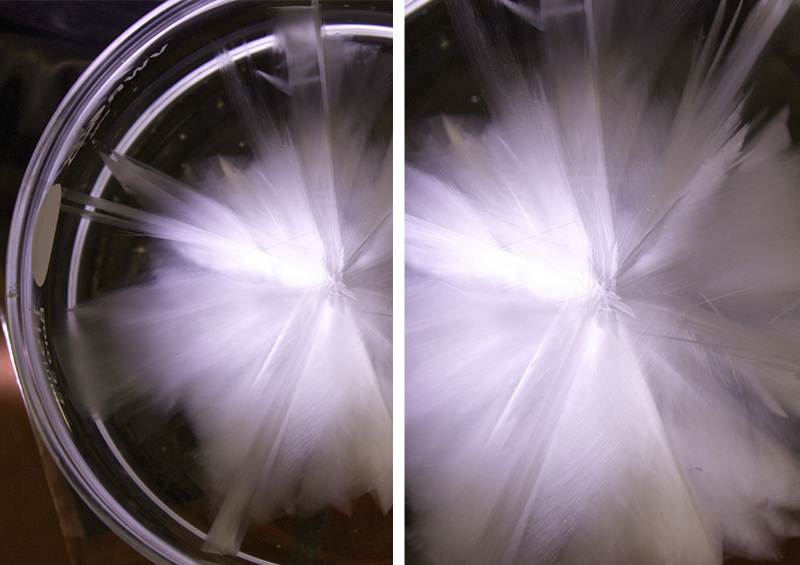 A crystallization step generates a 99% phosphoric acid in crystal form. The electronics phosphoric acid is then conditioned in a clean room. This excludes all forms of contamination and guarantees the level of particles during filling. The Certificate of Analysis is issued based on tests performed on a sample collected just before conditioning.